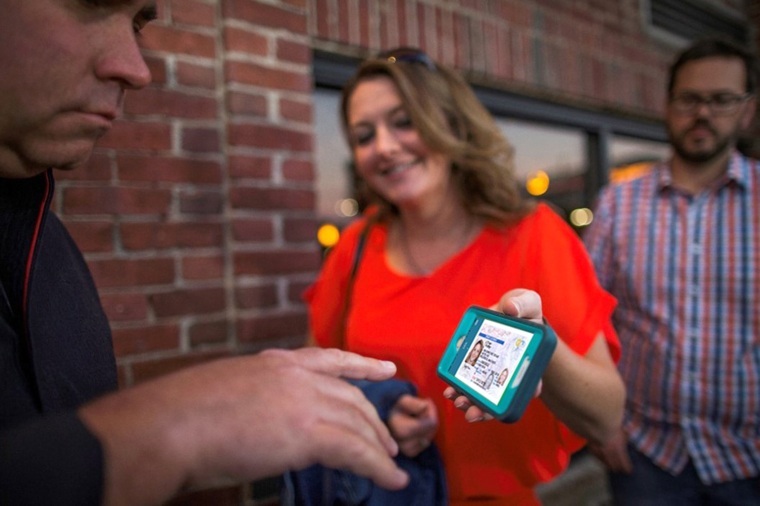 Several states are making the switch from plastic cards to smartphone apps. There's an app for almost everything these days, whether it's shopping, tracking your eating or exercise or finding your way. Now driver's licenses are making the transition from a card carried in a pocket or purse to a digital application on your mobile phone. Colorado, Delaware, Idaho, Maryland, Wyoming and the District of Columbia are carrying out limited trials of digital driver's licenses. Iowa and Louisiana are planning to issue digital licenses to every motorist who wants one beginning this year. "People are excited about it," said Rob Mikell, an executive with Idemia, a Billerica, Massachusetts-based software firm that has developed a digital driver's license for Iowa and is running a pilot program for digital licenses in Delaware. Though digital licenses vary from state to state, most will show the usual information — a photo of the registered driver along with the name, date of birth, license number, expiration date, and so on. The idea is that digital licenses can be presented to police and other authorities as well as to retailers to establish proof of age for purchasing alcohol or tobacco. But digital driver's licenses have features that plastic licenses lack, notably a date-stamp to show when the license information was last updated and the ability to update the license on the spot via a cellular network — a boon for police officers during traffic stops. The key advantage of digital licenses for motorists is knowing that their license information is stored on a mobile device instead of on a card in a wallet that might be left behind. Calvin Fabre, president of Envoc, a software firm in Baton Rouge, Louisiana, that helped develop a mobile app to display digital driver's licenses in Louisiana, said most drivers under 40 won't go back home if they forget their plastic license — "but if they forget their phone, they always turn around." If a cellphone's battery dies, of course, the license might be unavailable until the phone is recharged. What about the security of digital licenses in an age when it seems everything can be hacked? Digital licenses are protected by password, PINs and other security features in addition to the usual security built into phones, and state authorities can wipe a digital license remotely if a driver reports it lost to the Department of Motor Vehicles. Although these mechanisms might not be foolproof, plastic licenses have their own vulnerabilities. "If I lose my wallet, and let's say you find it, you've got my personal information — you've got everything you need to begin the process of stealing my identity," Mikell said. "But if you found my smartphone ... I can feel secure that my identity is protected." Not everyone is so optimistic. Mark Stringer, executive director of the American Civil Liberties Union in Iowa, told NBC News MACH in an email that the organization had "serious concerns" about digital licenses. He said cellphones are legally protected against police searches and added, "It's also important that any new technology be implemented in a manner that is accessible and nondiscriminatory for license holders." Obtaining a digital license is strictly voluntary for now, and states will continue to issue all motorists a traditional plastic license — so digital license programs should pose no hardship for indigent motorists. No matter what, motorists are eager to make the switch to digital licenses, at least according to Mikell. "Our feedback was like 'hey, we know this is coming, when is it?'" he said.